Nathaniel Rakich, an elections analyst at FiveThirtyEight, the data-driven site with a heavy focus on politics and sports, took what some might call a less traditional route to working in journalism. Rakich, who sees himself as a data journalist, found himself drawn into the profession not because he loved reporting, but because of his passions for politics and baseball. Growing up in the suburbs of Boston, Rakich was first introduced to journalism through working with his local paper in high school. He said the paper “piqued his interest in writing” as he contributed editorials and new stories. Rakich spoke on Jan. 24 at “Pizza, Press & Politics,” a speaker series hosted by the Northeastern University School of Journalism. After graduating from Harvard University in 2010 with a degree in Government, Rakich did a number of different internships. He worked for the Red Sox, interned with the Office of the Inspector General on Beacon Hill, and helped with political campaigns. Eventually, after working at a political consulting firm, Rakich decided that working in government “was too subjective” for him. Rakich started work for a research firm in Washington, D.C.. The job, Rakich said, was perfect since it was “one step removed from politics,” but still kept him involved. This is when Rakich started delving deeper into the world of data, and his interest soon moved from fascination to writing and analysis. In his free time, Rakich started a blog called Baseballot, a mix of baseball-related and political-related content, centered around the analysis of data. Using Twitter as a “chatroom” for feedback and promotions, Baseballot soon grew. By 2015, Rakich said his data analysis was more sophisticated and had 2,000 Twitter followers. Rakich soon decided he wanted to move into writing as a freelance journalist full-time. Although “scary” at first, this soon took hold, and Rakich worked in freelance for two years. Eventually, his work caught the eye of major news organizations, like The New Yorker, Politico, and The Boston Globe. Rakich connected with Micah Cohen, a reporter at FiveThirtyEight, and its founder, Nate Silver through Twitter interactions. At FiveThirtyEight, Rakich analyzes data about both politics and baseball. His current stories typically revolve around analyzing potential nominees for the 2020 presidential election. Rakich said he likes working with data, rather than so-called “experts,” who can be subjective. It’s more definitive to analyze a pattern of data and come to a conclusion, he said. 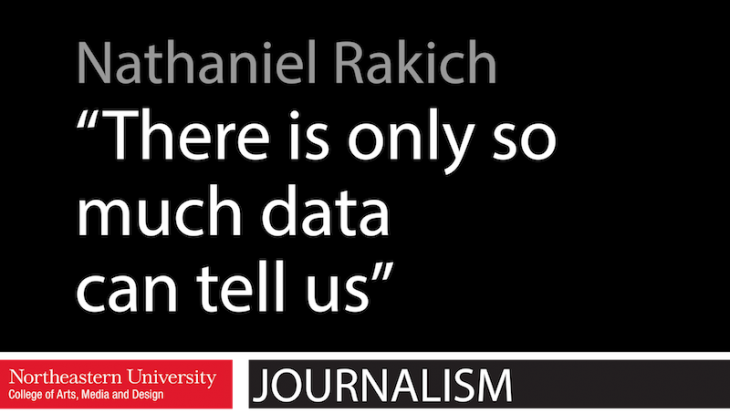 However, Rakich said he values the combination of both traditional and data journalism. He said this fusion is likely to be the future of modern journalism.